Night lights are one of the best ways to illuminate your house at night, keeping monsters away from your sleeping kids and giving you security and peace of mind. The dark can be scary for little kids, especially when starting to sleep alone in their room instead of with Mom and Dad! There are many great night lights for toddlers on the market. Some focus on providing a calm, warming light like the MAZ-TEK LED Night Light while others are made of fun, squish animals like the MOKO Baby Night Light or even display stars on the ceiling like the Rotating Sunnest Star Projector. Getting a good night’s rest is key for healthy growth and that can’t happen when you child is scared of the boogie man! We tried out all the most popular kid’s nightlight and picked our favorites! 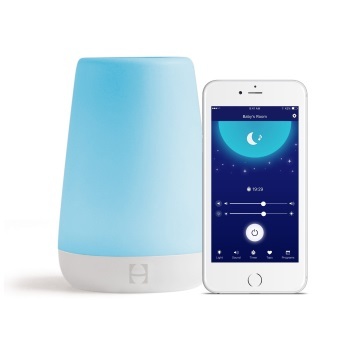 A night light, sound machine and time-to-rise alarm in one! Light up the bedroom with custom colors, brightness sound and volume! 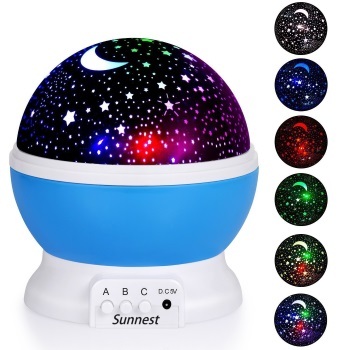 Light up the bedroom and inspire imagination with the night sky on your ceiling in multiple colors with the Rotating Sunnest Star Projector! When I first saw the Rotating Sunnest Star Projector I knew I had to try it in my Son’s room! This is way more than just a nightlight! It displays the night sky and cosmos on the ceiling in black and white, blue, red, green or multi color. It is perfect for use as a nightlight or for late night fun during sleepovers! The Sunnest Star Projector is controlled by three on board button allowing you to set the perfect color and mood. Unlike many other weaker star projector nightlights the Sunnest has no problem displaying ALL the stars on the ceiling. Since the projector is powered by either 4 AAA batteries or a USB cable you have multiple power options! The Hatch Baby Rest Night Light is a night light, plus a lot more! When I was a kid a night light was just something your plugged into the wall at night. This night light combines many important features like a sound machine and alarm clock, making it the perfect choice for toddlers that need to wake up at a set time! The Hatch Baby Rest Night LIght can be controlled via an app on your phone, or by touch. It is easy to use and alarms can be set without waking your baby up from a nap! Our family set specific colors so the kids know when it is time for bed and time to get up using their favorite colors! The Hatch Night Light might not be for babies and newborns, but it is a great option of toddlers that are learning a bedtime routine! MAZ-TEK LED Night Lights are perfect for any room in the house. We like to use them to set the mood in the kitchen and living room as well as illuminate the halls near the kids! Automate smart light sensors detect sunrise and sunset and adjust to fit the room. With 8 different color options you can find the perfect color for any situation! Stop running into things in the night. Light up any room or hallway of the house with soft, gentle light. These lights naturally blend well in any home, condo or townhouse and can match any color scheme! The MAZ-TEK is the perfect night light for families looking to light up their home at night to keep away monsters! Always on night lights like the Maxxima Mini Green are a good alternative for people that wake up multiple times per night and don’t want harsh white light waking them. New parents, pregnant women and people with bladder problems all know what it is like to be get up every few hours and have a bright light in your eyes! Green LEDs are a less distracting and stressful way to light up your bathroom or hallway without white lights! The Maxxima Mini Green may not be popular with kids, but if you are a parent with sleep problems that has to wake up multiple times per night try switching to these always on lights! 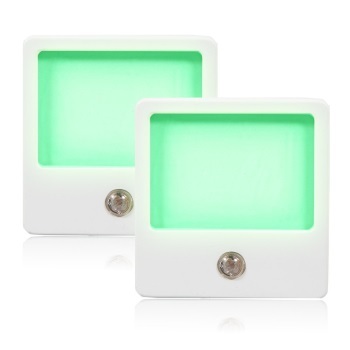 Light up dark hall ways, restroom and bedrooms with a soft, always on green LED night light! Not every night light needs to sit in a wall socket. 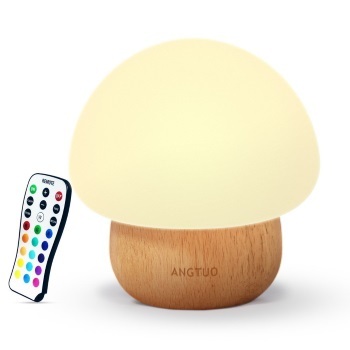 The ANGTUO Baby LED Mushroom Night Lamp is a fun way to light up your childs room while they fall asleep. The light sits on a nightstand, dresser or desk and passively illuminates the room with 16 colors and 4 different modes. It can be programmed to remember your favorite settings or be controlled from across the room with a wireless remote! The Mushroom Night Light is perfect for kids of all ages. The BPA free construction is safe to leave on all night and makes no noise, unlike cheaper night lights that buzz or hum. We like turning every day items around the house like night lights into fun shapes like Mushrooms to inspire imagination and curiosity! Mushroom Night Lights are a fun way to prepare your child for a good night of sleep. We like to use our to read a book before bed, then leave it on as our kids fall asleep. Right before bed we stop by their room and turn it off using the remote to save power! Recommended For: Kids that love babies! 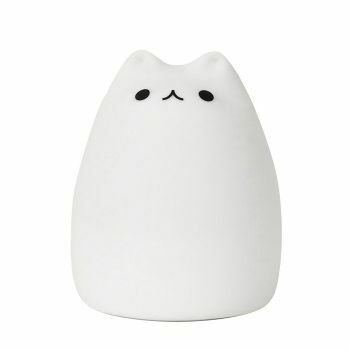 Cat night light are always a popular choice with kids, especially girls! The MOKOQI Cat Baby Night Light is our pick as the best cat night light for kids! It is made from BPA-free Silicone so it is fun (and safe!) to touch but still durable enough to last through rough play sessions. 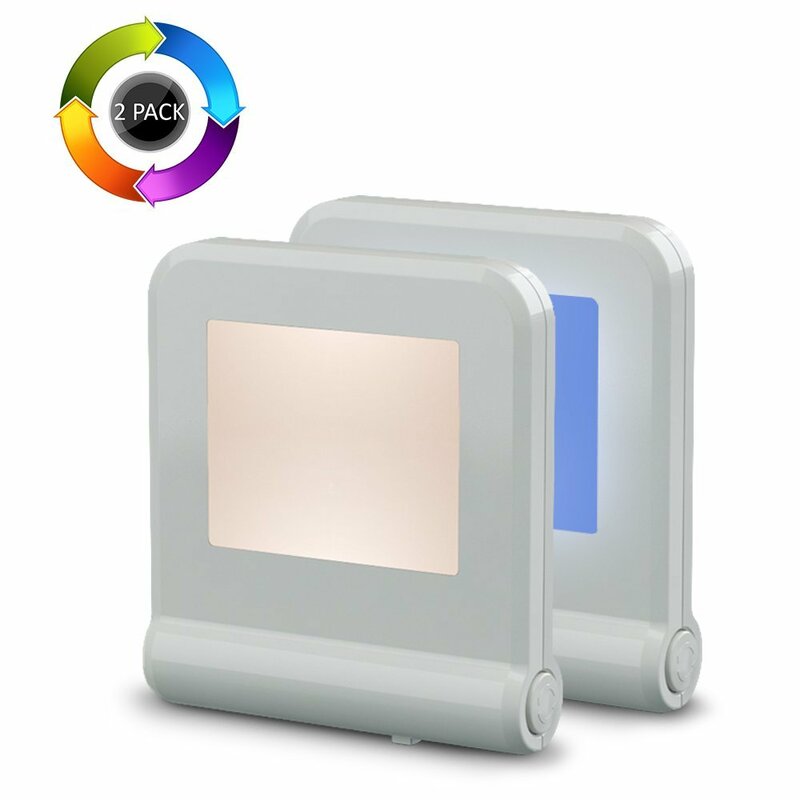 This night light has 8 colors and 3 dis play modes, plus a warm white light option to help set the mood while sleeping. It is no secret that little kids can be sticky! The MOKOQI Baby Night light is easy to clean so you don’t have to worry about what it looks like after a night camping in the back yard. With 15 hours of run time plus a quick recharge it is not secret while kids and parents alike love this night lamp! The MOKOQI is the perfect choice for kids that love to read in bed or are always on an adventure. Having a portable night light that can quickly be recharged via Micro USB makes traveling much easier and bed time that much more fun for the entire family! Recommended For: Best kids that love cats! 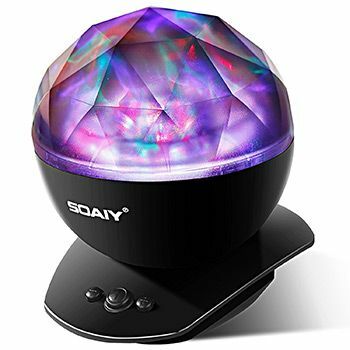 The SOAIY Sleep Soother Aurora Projection LED Night Light Lamp may not looks like what your expect when you open the box! Our family quickly fell in love with both the LED projections and relaxing nighttime noises! At first we had in the kid’s room but eventually moved it into the den for a nighttime light show! Just be careful, this product is fragile and might not survive a fall from the dresser. Night lights with speakers and lights shows are not for everyone. If your child has ADD, night terrors or other sleeping problems extra distractions might not be a good idea! The SOAIY shows red, green, blue and multi colored displays that will excite imaginations and send you peacefully to sleep! My favorite feature of the SOAIY is that it you can plug in your own music straight from your iPhone! I like to set the auto shut off at 1 hour and drift off to bed! I found it much better than falling asleep with the TV. Some people love falling asleep around the water. The LBell Ocean Wave Projector Night Light displays waves on the wall as your peacefully fall asleep to your favorite music from your phone or TF card. It can be controlled from a the unit or from across the room with the remote. The mini-speaker is just powerful enough fill a normal sized bedroom with music. Time it buy a night light and not sure which model to pick? There are hundreds of models online and in stores, finding the right one for your hallway or bathroom comes down to knowing what features you need! Some traditional models are just a hallway light that fits into a normal wall socket. 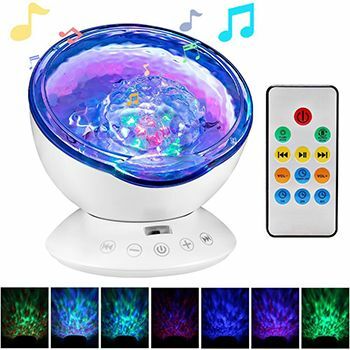 Other more advanced (and expensive) models can play music from your phone, run off batteries and display stars or ocean waves on the ceiling!